White House economic adviser Gary Cohn has responded to Donald Trump’s Charlottesville comments, insisting that the president had to do a better job condemning white supremacists. “I believe this administration can and must do better in consistently and unequivocally condemning these groups and do everything we can to heal the deep divisions that exist in our communities,” Cohn said in an interview with the Financial Times. Cohn aligned his views with the establishment media, reports Breitbart, asserting that the violent Antifa counter-protesters were “standing up for equality and freedom”. “Citizens standing up for equality and freedom can never be equated with white supremacists, neo-Nazis, and the KKK,” he said. I have been critical of the President for attempting to deflect away from the neo-Nazis in Charlottesville (SEE: Donald Trump's Asinine Charlottesville Deflection) but is more bizarre to place the Antifa in the category of defenders of freedom. The Antifa is a violent extremist group that wants to tear down the entire capitalist structure of America. “I’m a liberal, and I think it’s the obligation of liberals to speak out against the hard left radicals just like it’s the obligation of conservatives to speak out against the extremism of the hard right,” he added. This is further indication that Cohn is a New York leftist who has no clue as to what is going on in America. He reads mainstream media headlines and has no deep knowledge nor understanding---and the man is Trump's top economic adviser. Scary. An uncomfortable reality for most Trump supporters is that his "pro-worker" policies and aversion to free trade are not at all incompatible with left-wing economic ideology. I've even spoken with some self-described left-wingers who, even though they generally despise Trump, have expressed substantial appreciation for his role in getting the right to largely dump laissez-faire. Trump should've made this guy retract or resign the first time. The fact that he didn't then and won't now confirms Trump is being run by forces he cannot control. Hmmm. Calling every white person they disagree with a racist and a nazi and using this as an excuse to silence their opinions actually can be compared with the nazis but what it cannot be called is "standing up for freedom". The nazis and the kkk used violence and intimidation to silence the opinions of others while also having their respective racial scapegoats such as Jews or Blacks respectively. The antifa's racial scapegoat seems to be white males which seems to be a term of derision in this circle. Call me crazy, but the image of a bunch of hooded people destroying property, threatening peacefully assembling people with violence, etc. 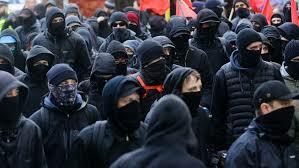 is not more acceptable if you are wearing a black hood than it is with a white one.